Scot Lines' SCOT ISLES was seen just after she had boarded her pilot at Kempock Point from the Clydeport cutter TOWARD on Thursday afternoon. 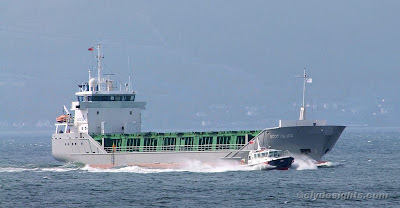 SCOT ISLES, which was seen recently at Sandbank, was on a regular sailing for the Scot Lines ships, which often arrive from Waterford with cargoes of plywood for King George V Dock in Glasgow. After discharging her cargo, she sailed again for Kyle of Lochalsh to load a cargo of round timber.